Global brand boss Toshio Furutani plans these changes. 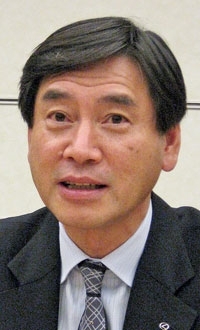 TOYOTA CITY, Japan -- Toshio Furutani, the straight-talking sales and marketing specialist who took over as Lexus' global chief last June, is turning his attention to a growing set of problems in the United States. Furutani is struggling to preserve Lexus' title as the best-selling luxury import in the United States. But some analysts say his plans could take the brand too far downmarket. The 56-year-old former head of Lexus' sales operations in Japan pledges to overhaul the brand by introducing smaller vehicles with lower sticker prices, adding more hybrids and moving away from stodgy sedans. He also has been taking notes from Volkswagen AG on how to leverage shared platforms between premium and mass-market models. And Furutani, who has held key jobs with Toyota in China, also is focusing on quality. Lexus' sterling reputation has been dented by last year's recall of 3.8 million Toyota and Lexus vehicles -- Toyota Motor Corp.'s largest recall -- to address problems with unintended acceleration. "In the past, the market was constantly expanding," Furutani said in an interview. "So the more we produced, the more we sold. That time is over. Customers' needs are changing. We are rescrutinizing each region's real needs." Last year Lexus not only was hammered by the slump in high-end sales, but it fell into a neck-and-neck race with BMW for the No. 1 luxury import spot in the United States after outselling its archrival for 11 straight years. BMW led during the first six months of the year, but Lexus clawed back into first place for the full year, winning the sales race 215,975 to 196,502. Still, the gap between the two luxury makers has narrowed considerably in recent years. More troubling for Lexus is that it trails BMW in all-important purchase consideration by probable buyers. 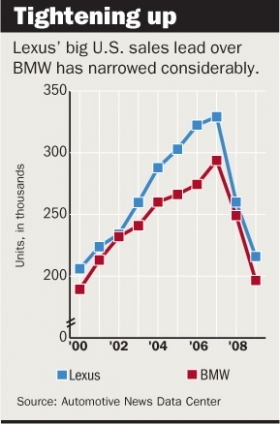 According to Edmunds.com, BMW led for the first 11 months of 2009, and the margin has been getting wider. In November, BMW's consideration rate was 7.2 percent of all visitors to Edmunds.com -- the brand's highest level all year. Lexus' rate was 4.3 percent, its lowest level since January 2009. "Lexus was really strong, but they've lost their footing," says Jessica Caldwell, a senior analyst at Edmunds.com. "BMW is the 'Ultimate Driving Machine.' We're not really sure what Lexus is." According to Compete Inc., a Massachusetts research firm that studies online car shopping, Lexus fell behind Cadillac in consideration in November. It was the first time the GM brand had topped Lexus in the monthly survey since January 2008. BMW consistently has been tops in the category among the major luxury import makes. Lexus and Mercedes had bounced back and forth been second and third in recent months -- until November. "Lexus needs more shoppers," says Lincoln Merrihew, automotive director at Compete, which defines consideration as shoppers who configure vehicles online. One problem for Lexus is that the average age of its buyers is creeping up. Furutani said it soon will approach the late 60s. Lexus market research shows that real buying power rests with the 25-to-49 age group. "The average age of luxury-car buyers is actually lower than that for mass-produced vehicles," said Furutani. "In terms of volume, the mainstream of the U.S. market is Generation X and Generation Y." Targeting younger buyers, who have less disposable income, means several changes: smaller, more fuel-efficient cars; lower sticker prices; additional unique body styles; and more hybrids. "The product will move toward being smaller in vehicle size, smaller in engine displacement, better in environmental performance and also a little lower in the price range," Furutani said. "The product that embodies this concept is the LF-Ch." The LF-Ch concept is a sporty four-door hybrid hatchback first shown at the 2009 Frankfurt auto show. Furutani bills it as Lexus' answer to the Audi A3 and BMW 1 series. The LF-Ch would be the brand's smallest offering. But Lexus is considering going a size smaller, with a compact luxury car that would compete with the Mercedes A class, Furutani said. The smallest car in the Lexus lineup is the IS, which starts at $33,020, including shipping. While he would not confirm the LF-Ch is planned for production, Furutani said current thinking is that Lexus' next product should not be a boring sedan. "If we build a smaller sedan, it has to have special features," he said. "The current Lexus lineup is mainly sedans. Therefore, increasing the variety of body types -- including coupes, SUVs, convertibles or hatchbacks -- will be what is required as a first stage." The success of the Lexus RX crossover underscores the appeal of nonsedan offerings. In 2009, U.S. sales of the RX were up 11 percent, making it the only Lexus model posting an increase. At 93,379 units, RX sales were nearly double that of any other Lexus. It is the only Lexus made in North America, although 40 percent of the volume still is imported from Japan. In the future, also look for more hybrids. Toyota plans to introduce a hybrid version of each model in its lineup by the early 2020s, and Lexus is at the forefront, Furutani said. "Lexus is the leader of Toyota's hybridization direction," he said. "I can even imagine a scenario in the future in which all Lexus models come only as hybrids." Toyota's expertise in gasoline-electric hybrid drivetrains is one way to attract younger drivers more aware of their carbon footprints, Furutani said. Lexus currently offers hybrid versions of the LS and GS sedans and the RX SUV. Until this year's introduction of the HS as the brand's first stand-alone hybrid, Lexus' hybrid pitch had been more about power than emissions. But that hasn't generated big numbers. Through November, Lexus sold 12,900 hybrid RXs in the United States, or 15 percent of total RX sales. The hybrid share is even smaller for the GS, at 6.3 percent of total GS sales. And for the LS, the percentage of hybrids drops to 2.6 percent. "They haven't been clear on their green message," says Caldwell of Edmunds.com. "For Lexus, hybrid has been more about adding performance to the drivetrain, not about being green in the way the Prius is." The LF-Ch would compete with the BMW 1 series and Audi A3. To cut costs, Lexus is also rethinking platforms. The lineup uses five platform types. That can be pared, partly by piggybacking more with Toyota brand models, Furutani said. "We always tried to develop the best platform for an individual model," he said. "As a result, we have too many platforms. In that aspect, Volkswagen is doing very good commonization and management of its platforms. We are benchmarking them." Moving into new niches and cutting costs are worthy goals. But the biggest challenge will be execution, says Chris Richter, an auto analyst at CLSA Asia-Pacific Markets in Tokyo. Rolling out hatchbacks and slashing prices could devalue the brand. "The main risk is not taking it too downmarket or alienating the existing customer base," Richter says. "You could spend a lot of money bringing it downmarket and then end up spending a lot of money trying to take it back upmarket again." A final challenge will be restoring the Lexus halo of quality. Last year's massive recall was triggered by an August accident that killed an off-duty California state trooper and three family members riding in a 2009 Lexus ES 350 sedan. Before the crash, a passenger in the car had called 911 and told dispatchers that the accelerator was stuck, and the car raced out of control to 120 mph. The recall is aimed at fixing the floor mat and reshaping the gas pedal so accelerators won't become jammed. Furutani apologized for the problem, calling it an opportunity to re-establish customer trust. He added: "There was no drastic drop in sales after the news." Richter says: "The public is cutting them some slack. In a way, Toyota got a suspended sentence. But they can't afford another fiasco like that."